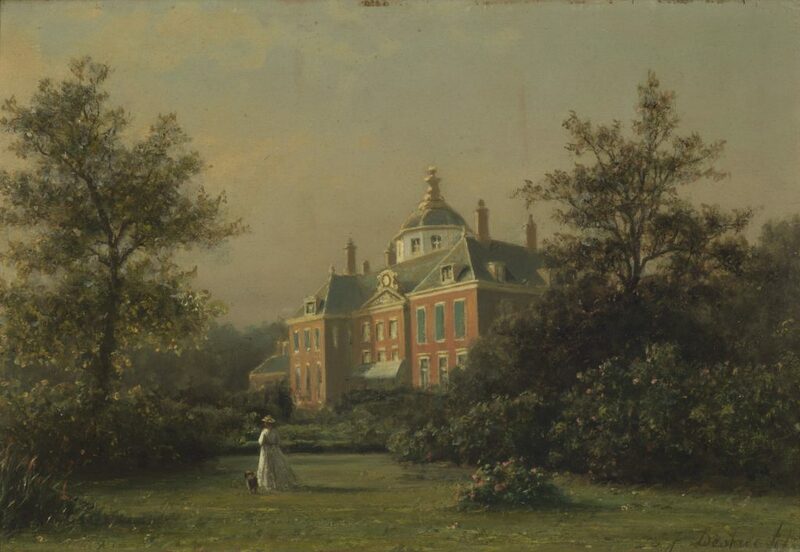 This painting was made by J. J. Destree (1827-1888),and shows an original view at the Palace Huis ten Bosch in The Hague. It’s painted from the garden side, with a diagonal view of the east facade. 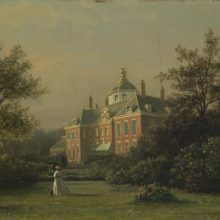 It shows the palace at the time of Queen Sophie (1818-1877), the first wife of King William III. She lived here for most of the year, after the (secret) separation in 1851. Destree painted the palace with bright lighting, and increased the park’s spatial effect by its diagonal view of the house and the scenic structure of the rhododendron bushes. In the park a woman dressed in white (possibly the queen?) walks with a dog at her side. Johannes Josephus Destree was born in 1827 in Laeken near Brussels. He lived and worked in The Hague, and was taught by A. Schelfhout and B. J. van Hove. Andreas Schelfhout’s work in particular had a great influence on that of Destree. In romantic imitation of the great masters of the seventeenth century, Schelfhout became famous for his beautiful brushwork, his compositions, and his beautiful skies. Destree pursued this craftsmanship and this style, but never got the same fame as his teacher. Like Schelfhout, Destree moved into the open countryside to make studies that were later used in the workshop as a reminder. A painting that was later made after these sketches did not need to be topographically correct, but could show an idealised representation that exceeded nature. Like many nineteenth-century artists, Destree loved to travel to Germany and painted views of the Rhine. Some panoramic views of his hand were well received, such as the panorama of the Duno near Arnhem.